How to Make Money Affiliate Marketing? Dare to Be Lousy. Affiliate marketing is a fantastic opportunity that anyone can use to make money on their own terms. How to make money affiliate marketing? First, you must learn the basics. Then you can master making money. I’m thinking you already know how this works, but let’s go through it super quick just in case you need a refresher. Company A has a product they are selling. They decide to start an affiliate program. I’m an affiliate and I like what Company A is selling so I sign up for their affiliate program. Company A sends me a special link with a tracking code. I start promoting Company A’s product through my website, YouTube Channel, etc. People start buying Company A’s product through my special link. Company A gives me a commission on the products that people are buying through my link. Company A sends me money. Yay! Here’s an infographic for you visual people out there. But, How Can I Make Money Affiliate Marketing? And you have to continue to do the last 4 over and over until you get steady traffic and steady sales. I wouldn’t be able to tell you how to do all of this in one blog post. I don’t even think I would be good at teaching this type of thing. That’s why I recommend Wealthy Affiliate. They are good at teaching this kind of thing step-by-step. They taught me, and they can teach you too, if you’re willing to take the time to learn how to do everything the correct way. Read my full Wealthy Affiliate Review Here. Now, here’s what I really wanted to talk about. I watched a video presentation this morning from Dr. Doug Lisle. Doug Lisle is a brilliant (and humorous) psychologist. He is very popular in the plant-based world where I spend the other half of my time, and does a lot of videos and Q&A sessions about weight loss and plant-based eating. But, this morning I was out for my walk and I found this video presentation by Dr. Lisle called Dare to be Lousy. (Video below.) I thought this would be an excellent video to add to this post because one thing that I think is extremely important when it comes to making money through affiliate marekting is mindset and expectations. 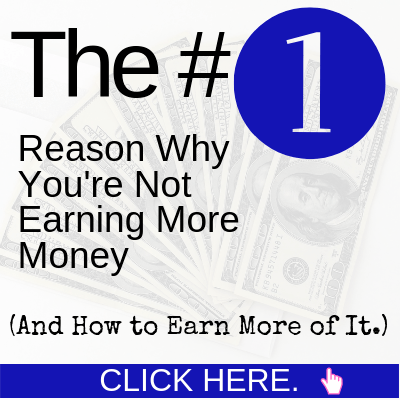 I see so many people come into this affiliate world, expecting to make money by day 2. And if that is your expectation, you will surely get frustrated and give up. The only true way to fail at this (and anything) is to give up. While it’s important to go through the proper training so that you have the skills to understand how affiliate marketing works, you have to first…dare to be lousy. One of the most interesting things that Dr. Lisle says in this video is that there was a music educator by the name of Gary McPherson who tried to figure out what made people really good at music. Was it their background? Were they good at math? Did they just have a good ear for music? Was their family income a key factor because those with more money could get better lessons? None of those things mattered. Instead, what he discovered is that when he asked the kids, “Do you see yourself playing this instrument 10 years from now?”, and the kids said yes, they were more serious about it and they practiced more and got better at playing. That was it. Please watch the video to get more insight into how this all works. The whole point of the video is that you have to put yourself out there. It’s scary because when you first do something, there’s a good chance you’ll be lousy at it. Dare to be lousy! Because when you’re lousy, you can learn to get better and better and better. I relate all of this back to affiliate marketing because when you’re first getting started, you will likely be kind of lousy. But if you ask yourself this question “Do I see myself as an affiliate marketer in 10 years?” and the answer is “Yes!”, then know that you will get better with practice. If you really have a desire to be successful at this, you will be. 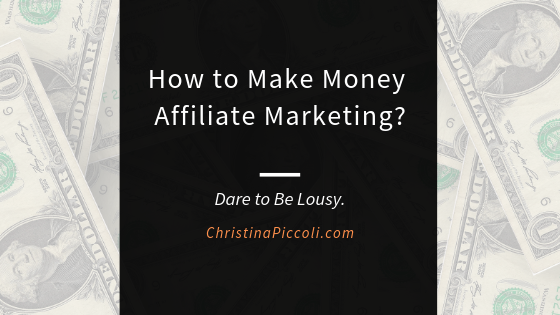 All of the ins and outs of how to make money affiliate marketing don’t matter all that much. Because you learn the best ways to make money as you go. What really matters is how much heart you put into this business. And whether or not you really give it your all. If you really want to succeed and you can see yourself doing this 10 years from now, then you have to give yourself at least a full year to really get it going. It takes time and effort for anything worthwhile to come about. Think of that year as you planting seeds. And after a year’s time, you’ll begin to reap what you sow. You’ll start growing beautiful trees, and those trees will produce more seeds, and pretty soon you’ll have an entire orchard of success. Image what that will be like. Are you going to dare to be lousy? Where do you see yourself 10 years from now? Leave me a comment below. What is the Secret to Affiliate Marketing? All Will Be Revealed! What is Wealthy Affiliate? Scam or Legit? You are right! I will be successful! It just takes patience, time and work. I am in for the long haul too, and looking forward to my future as an affiliate marketer. Yes, I was lousy at first, but slowly and surely learning and getting better at it! Great! It seems like you have the right attitude to be successful. Little by little, the more you do, the more you learn and you keep getting better. Thanks for stopping by! Great post!! I love the outlook. Affiliate marketing can seem daunting and confusing, but the only way to do it, is to throw yourself into it and keep trying. Just keep swimming, I think Dory said in Finding Nemo. Just keep swimming. Great article Christina! 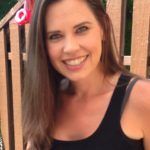 I had been researching affiliate marketing for months and months before deciding to just jump in with both feet and never look back! It is a long learning process, but I am loving it so far. Thank you for sharing. It takes time to learn everything, but it’s fun learning, right? There’s are no holes there, one Headline and content piece resonates with me a LOT. The methods and training you’ve highlighted I’ve seen and it’s very effective. This is a wonderful article and something I definitely needed to hear! I’ve been trying my hand at affiliate marketing for about 3 or 4 months now, with not much reward. It’s nice to get articles like this that are about the benefits of perseverance! I loved the title of your article. I just finished my first year of affiliate marketing with Wealthy Affiliate. I will admit that my site was lousy and sometimes I still feel that it is lousy, but the great thing is that I made a ton of progress. I am excited for the future. I’m sure your site isn’t lousy! But there’s always room for improvement as you learn new skills and come across different ideas. And progress, not perfection is key! And it sounds like you have a great mindset around the expectations now. Good for you for coming back and trying again. It’s never too late! That was great. I sure do Dare to be lousy lolo. I had never seen that video and I think it was great. It is amazing how you can create your own style in Affiliate Marketing and still be successful. The market competition allows for you to create and learn. I see myself in 10 yrs totally on autopilot! And I love that you are into the plant based lifestyle. I do believe that is the answer especially in the medicine world. Our bodies reject all that synthetic stuff and create more problems. Are you a Vegan? I am still a carnivore but am on a journey so who knows? We all SHOULD dare to be lousy! It’s how we learn. 🙂 I love that you see yourself on autopilot in 10 years. Ahhh, that does sound very nice! And yes, I do consider myself vegan / plant-based. It’s an easy transition when you decide to do it. Once I made that decision, I figured it all out. It’s been great so far.